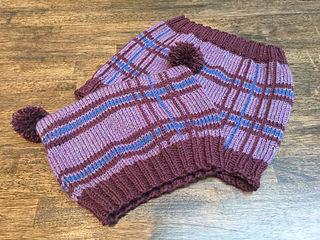 A fun and colourful hat and cowl set that’s easy and quick to knit using elann.com Highland Majesty Sport held 2 strands together (or another aran weight yarn). Worked in the round in stripes of colour, the vertical lines are added afterwards with a crochet hook or duplicate stitch. 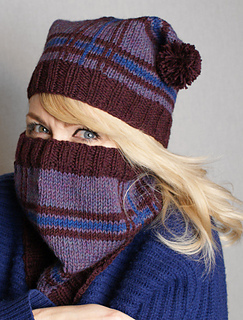 The cowl is worked as a simple tube, and the hat, with no crown shaping, is finished very simply with a 3-needle bind off, or if preferred, it can also be grafted together using Kitchener stitch. Tassles or pompoms complete the look. NOTE: Purchase of pattern includes both Plaid Hair Day for Aran weight and Ombré Hair Day for DK weight. 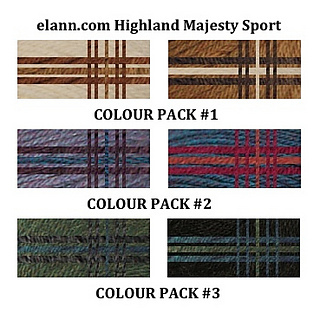 Materials: 3 x 100g balls of elann Highland Majesty Sport (yarn held doubled throughout). Set used approx. 353, 352, 370m (384, 384, 404 yds) for MC, 257, 304, 376m (280, 331, 410 yds) CC1 and 115m (125 yds) CC2. NOTE: Suggested yarn is held 2 strands together for Aran weight! OR approx. 176, 176, 185m (192, 192, 202 yds) MC, 128,152, 188m (140,166, 205 yds) CC1, 58m (63 yds) CC2, of an Aran weight 18st/10cm (4”) yarn.